Since 1914, CID has been committed to preparing professionals who serve children with hearing loss who are learning to listen and talk. This commitment is reflected through our curricula, educational tools, free online courses, workshops, guided observations and consulting services. To date, our products and services have been used by professionals in more than 50 countries spread across six continents. Whether you’re a teacher of the deaf, special education teacher, speech-language pathologist, early interventionist or audiologist, we want to work with you. Our goal is to help you learn more, teach effectively and lead not only the children you serve, but your colleagues as well. Please contact us to discuss how we might help meet your professional development needs. Ask us about our distance learning opportunities and other options. ASHA and LSLS continuing education credit is available for all CID courses and workshops. Click on any of the links above to access free information on a variety of topics that pertain to the work you do with your students. Meet the Emerson Center for Professional Development Advisory Council! We have gathered these leaders in the field of deaf education to gain their insights as we strive to develop the most effective and relevant programs and tools for professionals. How can groups view the online courses? For online course group viewing options, please visit our group view page by clicking here. You have 30 days to return your purchase in like-new condition for an exchange or refund. All sales are final after 30 days. For questions, contact professionaldevelopment@cid.edu. How are the SPICE and SPICE for Life curricula different? They target different listening skills. 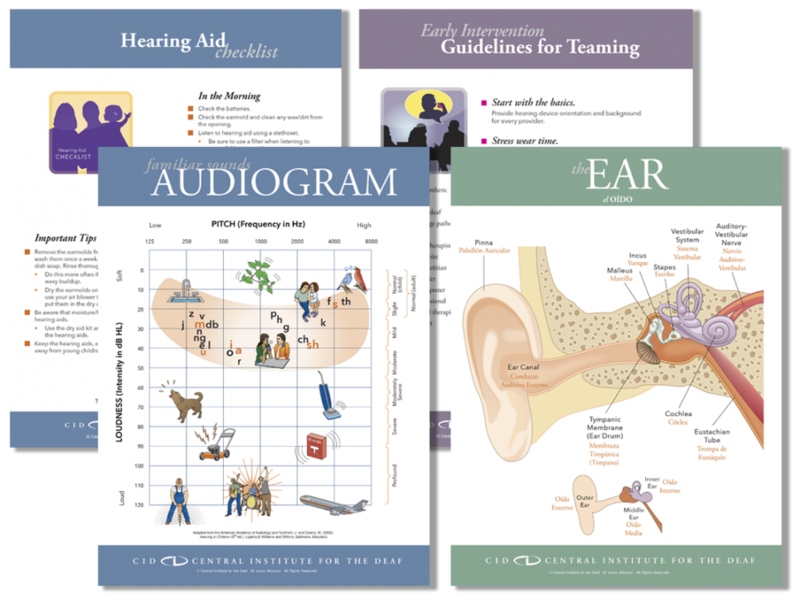 The CID SPICE for Life curriculum targets development of a variety of listening skills. Can I use SPICE for Life with a student who hasn’t completed the SPICE skills? In most cases, we recommend using both curricula with these students. This promotes well-balanced auditory development and provides variety for the student. Some SPICE for Life skills, such as developing auditory memory, can also contribute to a student’s learning of language and vocabulary, allowing her to continue to make progress in the vowel and consonant perception and connected speech goals of SPICE. Can I just order the toys from the SPICE kit or replace the ones I am missing? No, the toys are not sold separately. The only components of the SPICE kit sold separately are the manual, rating forms and acoustic hoop. Can I order an extra set of the SPICE picture word cards? No, the SPICE picture word cards and sentence/nursery rhyme cards are not sold separately. The only components of the SPICE kit sold separately are the manual, rating forms and acoustic hoop. How does CID TAGS compare to rating forms available from other organizations? TAGS is one part of a full system for progress monitoring for listening, language and speech. It is a functional assessment that is specifically for syntax. It includes lists of grammatical structures that are commonly produced in English. The forms are a great way to keep track of what grammatical structures students are and are not using. In addition, TAGS are useful for providing data in addition to standardized test scores. Will your workshops be held in the spring or summer? Our on-site professional development workshops are presented each fall at CID in St. Louis, MO. For dates and titles of upcoming workshops, please click here. If you’re interested in having CID bring a workshop to your location, please contact us at professionaldevelopment@cid.edu or 314.977.0133. How can I order CID publications if I am outside of the United States? Orders from outside of the continental United States cannot be placed online, as our system is unable to calculate the shipping costs that depend on the size and weight of the package(s). You may place your order directly by emailing us at professionaldevelopment@cid.edu or by calling 314.977.0133 (phone), 314.977.0016 (fax). Please include the items and quantity you wish to order, the complete name and address for billing and shipment, and payment details.